Bart: Daddy in three years you will be 71. Bart: Sorry, that’s Granddad. I meant to say, you will be 65. Jay: Hey! I’m only 48! AJ: Is it true you are an adult at sixteen? Me: Well you can do adult things, like get married, but we wouldn’t be pleased. Jay: We would say no. Sixteen is much too young. Me: Daddy and I were twenty and that seems young now. Jay: I see twenty years olds and I do think them too young to get married. Me: But it worked for us. Jay: That’s because Mummy met me and knew she would never find someone better. This morning the girls were sat at the table while Jay and I got together the breakfast and packed lunches to the sound of the radio playing in the background. Today Jay had the day off and I headed out to work in the morning. I dragged myself out of bed at 7.15 and left him sleeping with our youngest daughter snuggled up beside him. I had only been downstairs about fifteen minutes when Bart appeared in the kitchen. “I don’t know, Daddy is in charge of your breakfast today. Now off you go, back up to bed for a lie down” And off she trots. Five minutes later AJ skipped in. “I am going to go see Daddy” And she disappeared back upstairs. Ten minutes later both girls reappeared in the kitchen and sat at the table. “He is getting up now” AJ replied. A few minutes later Jay strolled into the kitchen fully dressed. “What’s for breakfast?” Bart asked innocently as she and AJ sat grinning at each other. 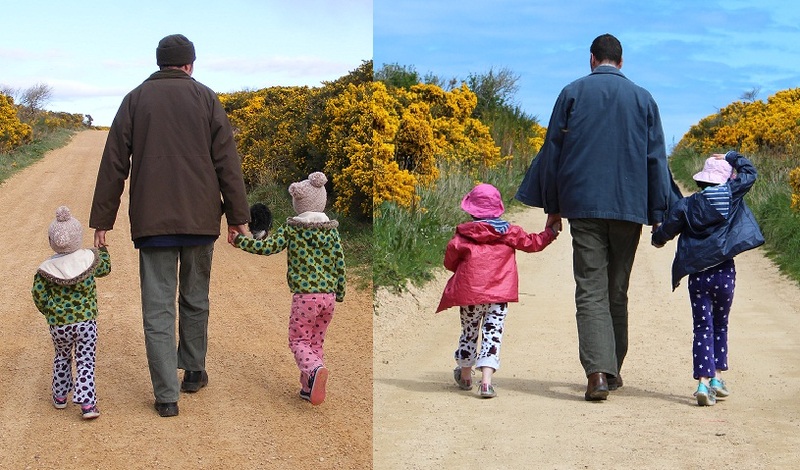 The first photo is from March 2012 and the second was taken yesterday. Our little girls are growing fast. While we were out shopping with her Christmas money, AJ, Jay and I popped into Clarks to buy her a new pair of shoes. After looking at a few styles AJ and I finally agreed on a pair of purple patent mary janes with a little bow and lights in the heels that flash when ever she walks. 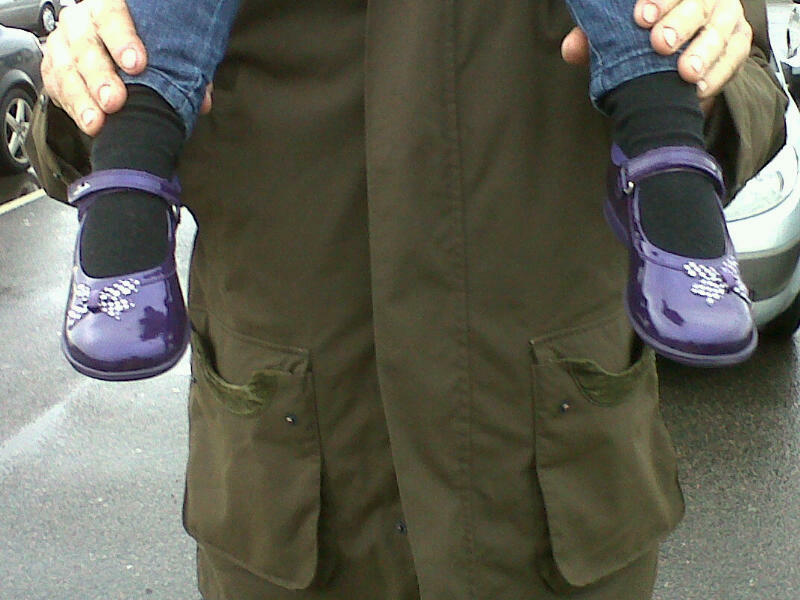 Now, like any female young or old, she wanted to wear her new shoes straight away, but we had a problem. It was raining and she did not want to get her shoes wet. 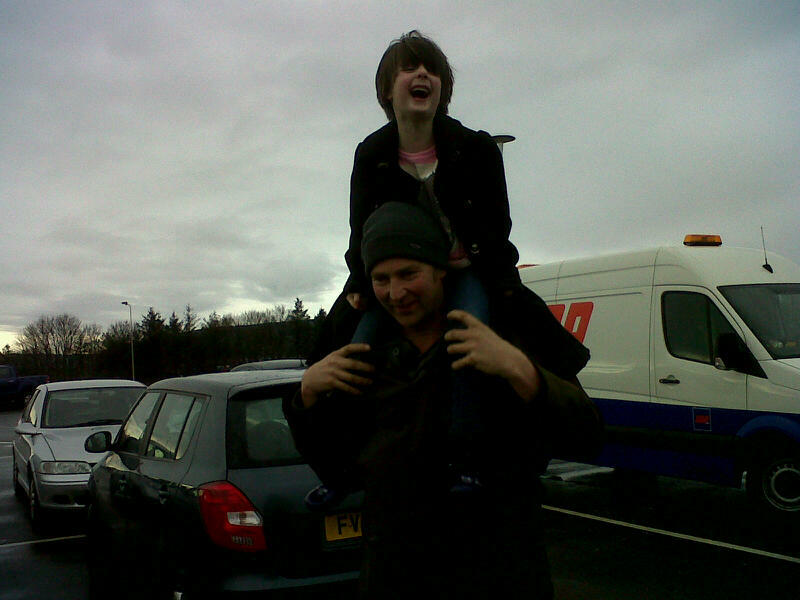 Thank goodness she had her own personal slave Daddy to carry her from the car to the shops and back! Dipping My Toes into Hairdressing. The Only Patch of Sunshine. I am a Mum living in Scotland with my husband, two daughters and quite a few four pawed furry family members.